Visual inspection is the first test performed during performance qualifications. 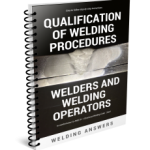 Specific instruction can be found in AWS D1.1 Structural Welding Code – Steel 4.9 Methods of Testing and Acceptance Criteria for WPS Qualifications (same applies to performance qualification). After a fillet weld or groove weld is made, visual examination looks for weld discontinuities such as cracks, craters, excessive reinforcement, weld size, undercut and others. No sense is performing destructive testing if performance fails initial visual inspection of the weld. Bend tests are specific to groove welds. They can either be side, root or face bends. This type of testing is ensuring soundness of the weld. The goal is to have no discontinuities on the bent surface, although most codes have allowances for certain types of discontinuities. After the parts are bent, VT is performed and all discontinuities are measured and then compared to maximum allowed values. A macroetch test is done to evaluate if the welder achieved fusion to the root of the joint as well as the side walls. This is only required on fillet welds as bend tests would reveal any problems associated with lack of fusion on groove welds. The macroetch can be measured so we know other important values such as depth of penetration at the root and sides. AWS D1.1 requires fusion to the root but not necessarily beyond. This is a useful test, but has one important limitation: you are evaluating fusion and penetration at one specific spot. Cut the part an eighth of an inch to either side and you may have different results. To compensate for this, fillet break tests are performed. A macroetch tests can reveal lack of root fusion which is not acceptable in welder performance qualification for fillet welds. In a fillet break test a section of the joint is cut out, usually about 4 inches in length. The specimen is then placed on a vise or a press and the root of the joint is placed under tension until the part breaks or folds over itself. The break is then examined to assure that there was fusion to the root. A fillet break test reveals if root fusion was achieve over a specific length of weld. Codes allow for the use of radiographic testing (RT) in lieu of bend tests in some cases. Additionally, depending on what standard you are following you may be able to use other testing methods such as ultrasonic testing (UT) and leak testing (LT). As always, know the code or standard you are working with as it will provide all the necessary information regarding the tests needed for performance qualification. Question. 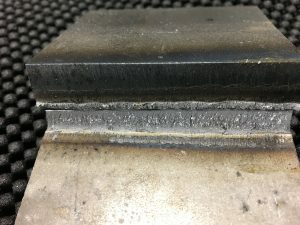 If a welder qualifies for 3G using a 6010 root and 7018 fill and cover passes, is the welder qualified for 3F with using 7018 only? Table 4.12 says re-qualification is required going from an electrode with a lower to higher F number. So in general 7018 to 6010 is OK, but since the root pass on the 3G test was done with a 6010 and the root pass on the fillet weld will be 7018, would this situation require re-certification? Hello James. Excellent question. This is one where many people can different interpretations of the code. However, when you perform the 3G test as describe the operator would be qualified to weld 3G with 7018 even if it is the first pass (root pass). With the test as is (6010 root, 7018 fill and cap) the welder is being qualified for both electrode F-numbers. The only thing that may be missed is that you would not be qualified to weld 7018 root passes on open root joints – you would need a backer or a procedures where you backgouge. This is because the 6010 root is acting as the backer. In a fillet weld you do not have an open root so your welder is qualified to run a 7018 3G fillet.